Event Management is packed full of “true to life” examples of events across the nation—illustrating all the skills needed to become a successful event manager. 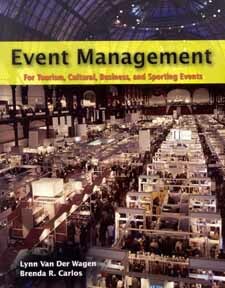 From this book, the reader will learn how to design, plan, market, and stage an event. In addition, readers will learn how to manage staff and staffing problems and to ensure the safety of everyone involved. Topics will also discuss what is needed for legal compliance, risk management, financial control and successful event evaluation. Size of Events. • Types of Events. • The Event Team. • Code of Ethics. Developing the Concept. • Analyzing the Concept. • Designing the Event. • Logistics of the Concept. Keys to Success. • The SWOT Analysis. Relevant Legislation. • Stakeholders and Official Bodies. • Contracts. Nature of Event Marketing. • Process of Event Marketing. • The Marketing Mix. • Sponsorship. Image/Branding. Advertising. • Publicity. • Public Relations. The Budget. • Break-Even Point. • Cash Flow Analysis. • Profit and Loss Statement. • Balance Sheet. • Financial Control Systems. • Panic Payments. Process of Risk Management. • Incident Reporting. • Emergency Response Plans. • Standards for Risk Management. Develop a Mission/Purpose Statement. • Establish the Aims of the Event. • Establish the Objectives. • Prepare an Event Proposal. • Make Use of Planning Tools. Titles. • Dress for Formal Occasions • Protocol for Speakers • Religious and Cultural Protocol. • Protocol for Sporting Ceremonies. • Rules for Flag Flying. Choosing the Event Site • . Developing the Theme. • Conducting Rehearsals. • Providing Services. • Arranging Catering. • Organizing Accommodation. • Managing the Environment. Developing Organization Charts. • Preparing Job Descriptions. • Recruitment and Selection. • Drawing Up Rosters. • Training • . Briefing Staff. • Managing Legal Requirements • . Preparing Staffing Plans. • Developing Recognition Strategies. • Managing Volunteers. Developing Leadership Skills • . Managing Temporary and Diverse Teams. • Group Development. • Improving Communication • . Time Management. • Planning and Managing Meetings. Logistics. • Policies • . Procedures. • Performance Standards. • Functional Areas. • Leadership and Staff Motivation. Security. • Occupation Safety and Health. • Incident Reporting. The Crowd Management Plan. Major Risks. Crowd Management. Emergency Planning. Implementing Emergency Procedures. Monitoring and Control Systems. • Operational Monitoring and Control. • Evaluation. • The Broader Impact of Events. Careers in a Changing Environment.